Hello again and Happy New Year! Like you, my last post was all about my New Year’s Resolutions and how I want to grow my blog in 2016. 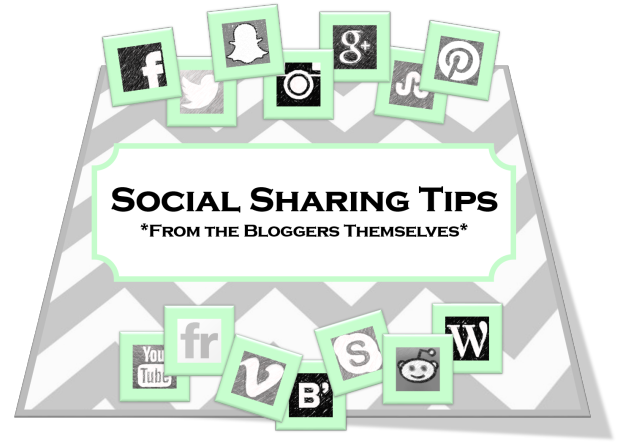 With this, I took to the blogging networks and asked other bloggers a few questions about Social Sharing. I asked each blogger how many monthly views they have, their top three referring sites, and any tips they would like to share about social sharing. I am very pleased to say that I gathered quite a bit of information from fellow bloggers and would like to share it with you all here. My top three referring sites are StumbleUpon, Reddit, and Facebook. Suzi Whi tford of startamomblog.com has been blogging for 3 months and has around 4.2k views for the month of December. Her top three referring sites are catholicnewsagency.com, carrotsformichaelmas.com, and Facebook/search engines. Anthony D. Greene of tonygreene113.com has been using WP for little over 9 years and has around 200k views for the month of December. His top referring sites are Facebook, Google, and Pinterest. Jennifer Peters of BecauseImCheap.com has around 30k views per month. Her top referring sites are Google Search Engine (SEO), Facebook, and StumbleUpon. Jay Gray of jaydgray.blog.com has around 250k views per month. His top referring sites are Google, Twitter, and Instagram. Kari! Thank you for the shout-out, truly appreciated! I have a few more of my tips to get traffic to your site that I will post in 2 weeks when my site officially launches! 🙂 So.Excited!! You’re welcome! I’ll come take a look! Thanks for these tips from fellow bloggers. It just so happens that I’m approaching my 3-month blog anniversary and it’s nice to be able to compare my page views to others and see how others are getting their content out there. Thanks for the great tips. My blog is almost 3 months old and it’s nice to be able to compare my page view numbers to other people. It’s also awesome to hear how other people are getting their content out there! II’m approaching my fourth month and I only have 500 views in my month of December this is a motivator. Nice post. I think it’s important to make use of several networks to increase your exposure. Also, it’s crucial to invest time in your blog. If you create great content, your readers will keep coming back for more. I love hearing what works for other bloggers. Everyone has such valuable advice.